“Stay Warm”, the new winter themed album by Toronto’s The O’Pears is quite lovely, and highly recommended for those of us who love snuggling up with some good tunes during the dark days of the winter. This is definitely not your typical seasonal fare, as it very carefully skirts the schmaltz and over the top nature of many holiday albums, in favour of a grounded approach that focuses more on winter as the season, recognizes the challenges that many people feel at this time of year, but also celebrates the joy of settling down to enjoy the shortest of days with family and good friends. The album features twelve songs – seven originals (including a musical version of Boris Pasternak’s poem “Winter’s Night”), a well chosen cover (Joni Mitchell’s River) and a few winter classics with some fine band arrangements, beautiful harmonies and wonderful a cappella. 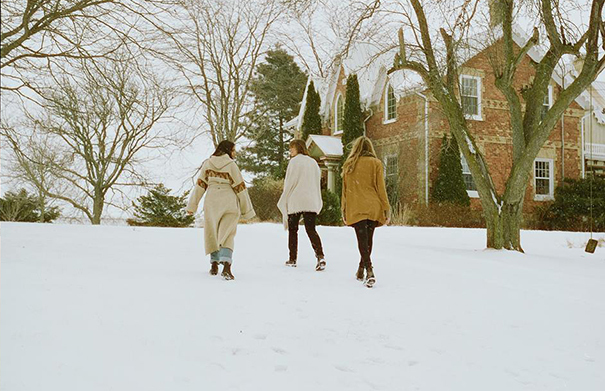 To learn more about the new album, we caught up with Lydia Persaud, Meg Contini & Jill Harris from the O’Pears at home in Toronto. For more information about The O’Pears and their upcoming tour dates visit theopears.com. Music: The O’Pears “A Candle Burned”, “Stay Warm”, “Hearts Grow Fonder” and “Find The Sun” from “Stay Warm” (2018, self) CDN.